In each edition we plan to offer at least one piece of free CET content. 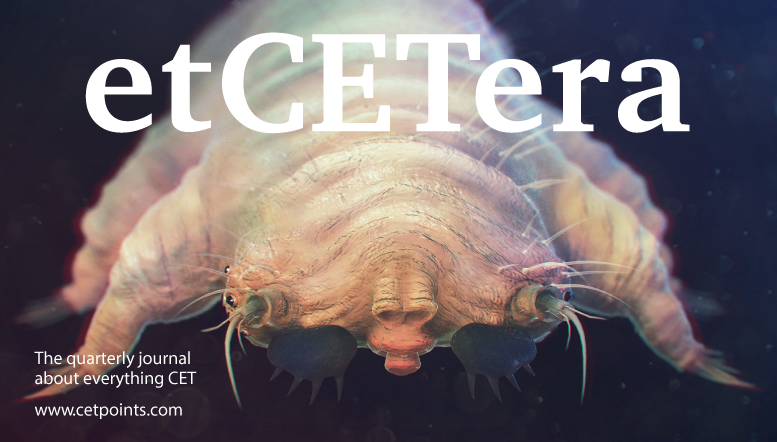 In the June edition you can read David Crystal‘s fascinating article on Demodex, and then take our multiple-choice questions to complete your CET point. Heidelberg Engineering have also included a fantastic piece of CET on four case histories of patients with macular disease. This month’s edition also features interesting articles on the new GOC Standards of Practice competency and CET interactivity. Keep an eye out for etCETera – we’d love to know what you think! We send a copy of etCETera to every practice in the UK. If your practice doesn't get one, let us know and we will add you. Just call call 0131 526 3900 or email support@cetpoints.com. We can't post out extra copies but you can access the current digital issue of etCETera online at any time. You'll find past issues there too.